It is absolutely that time of year again. I can’t say I’ve ever really been a huge fan of green bean casseroles. I think canned beans has a lot to do with that, along with the whole, you know, not vegan thing. I got some beautiful organic green beans in my veggie box yesterday, and I figured I’d do an updated, fresh, vegan green bean casserole. But it’s been done. And done right. By the ever-brilliant Susan of FatFree Vegan Kitchen. Check it out! Fresh beans and a homemade gravy; there’s nothing canned about it. So Susan had scooped me by about two years. What was I going to make? Well, I realized that since I didn’t really like green bean casseroles all that much to begin with, why make a casserole at all? And why not make the fried onions from scratch? And leave the gorgeous beans whole and beautiful? If you like green bean casseroles, by all means, go over to Susan’s blog and make that one! 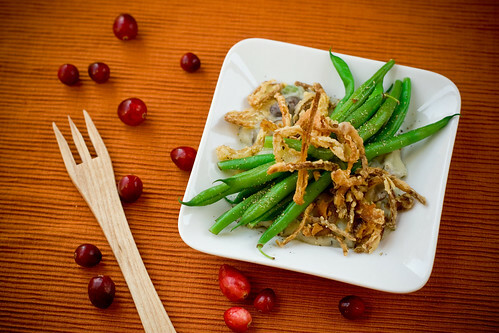 It’s the one I would make, and it’d probably be the first green bean casserole I’d like. 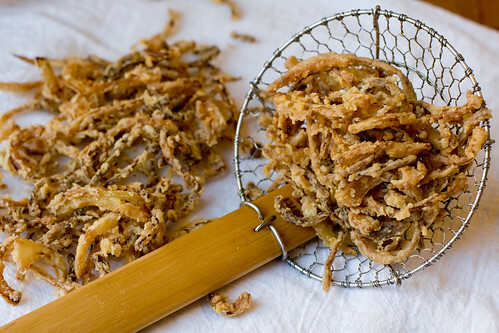 If you’re up for it, use the homemade fried onions from here to top it off. I know people love French’s, but homemade ones don’t have hydrogenated oil, TBHQ, or propylene glycol in them. And you can make them ahead of time, too! If you don’t like casseroles all that much, but do like fresh beans, fried onions, and mushroom gravy, then give this a shot. It makes a beautiful starter or side dish. *I thought it would be really smart to use the soymilk I soaked the onions in to make the gravy. It wasn’t. It gave the gravy an overwhelmingly raw-onion taste, and ruined it for me. Unless you really, really like onions, I suggest using fresh soymilk for the gravy. Begin by making the fried onions. Cut the ends off the onions, peel them, and slice them in half lengthwise. Slice them thinly into half-moons. 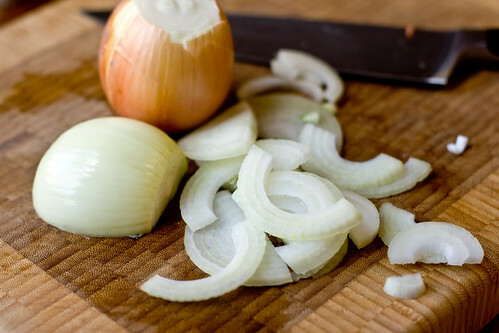 Try to keep your slices all the same width so that the onions cook evenly. Soak the onions in 2+ cups soymilk for at least 10 minutes. Heat oil over medium heat in a wok or other pot to a depth of 1-2 inches. I’ve found that I can use less oil to fry in a wok; since the sides are curved the oil pools in the middle. 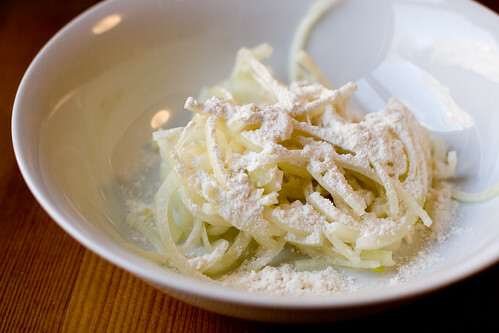 Grab a handful of onions from the soymilk, shake them off a little, and place them in a bowl. Coat with flour completely, tossing with two forks to keep your hands clean. Use enough flour so that they’re not soggy. Next, bring a large pot of salted water to boil. 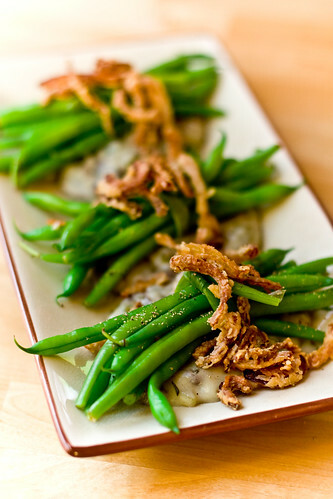 Blanch the green beans for 1-2 minutes, or until tender crisp but still bright green. Shock in an ice bath to stop the cooking, drain and set aside. In a skillet, saute sliced mushrooms and celery in 1 Tbs of oilve oil until tender and fragrant. Season with a pinch of salt. Remove to a bowl and add earth balance margarine to the same pan over low heat (don’t bother to clean it out!). Once melted, add flour and whisk well to create a roux. Slowly add in the soymilk while whisking, turn the heat up, and whisk while it thickens to form a smooth sauce. Add thyme and salt to taste, adjusting the thickness by adding more soymilk if needed. Stir the mushrooms and celery in. 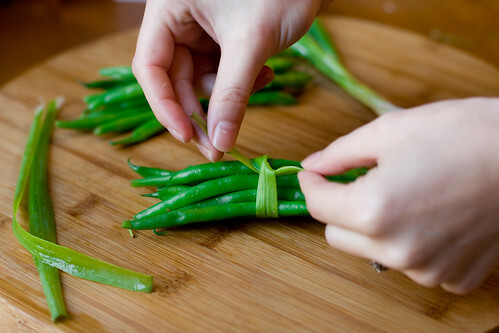 Slice the chives in half, lengthwise, and use them to tie up little bundles of green beans. 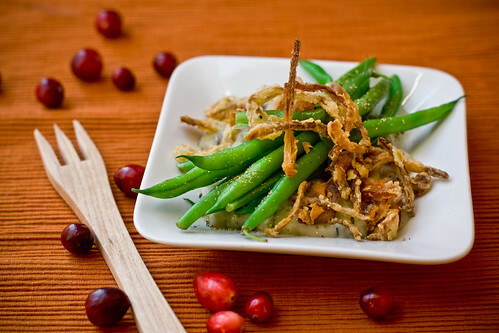 You can reheat the green beans before serving by placing in a low oven or quickly steaming. To serve, place a few spoonfuls of gravy on a dish, and place the bean bundle on top. Sprinkle with fried onions and grind fresh pepper over everything. Enjoy! Doesn’t the Earth Balance Margarine contain Palm fruit? The cultivation of Palm Oil and all of it’s products is responsible for the slaughter of the Orangutan population in countries where they live.